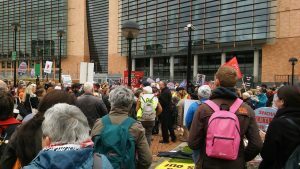 “We were a group of adults and kids chanting outside the minister’s department, holding up our signs and singing through the megaphone. There were also kids who climbed up onto the stone wall and waved their signs and took turns with the megaphone, chanting.” — Raphael Marshall-Strang, age 9, describing the protest. 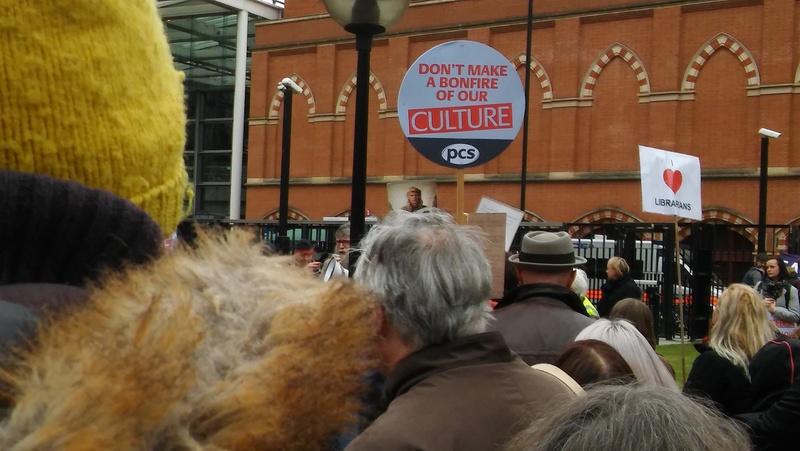 Children from Barnet with their parents and grandparents delivered an invitation to the Department for Digital Culture Media and Sport (DCMS) to the new Culture Secretary, Jeremy Wright QC, to come on a tour of Barnet Libraries in September 2018. 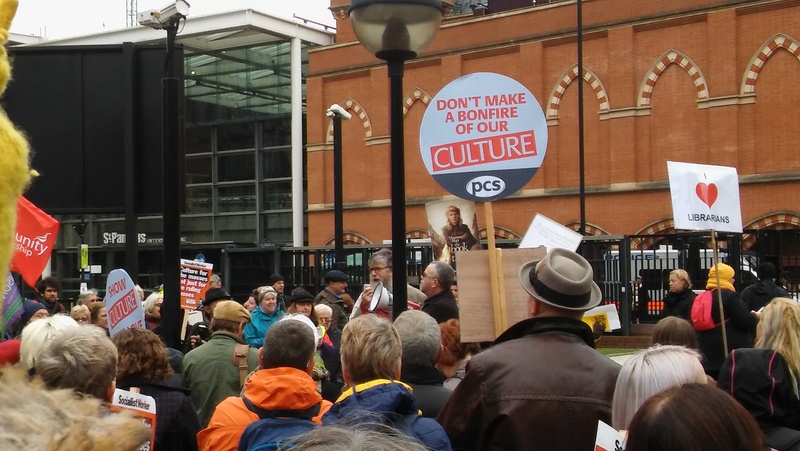 It was handed over to DCMS representatives Simon Richardson, head of libraries, who has been handling the Save Barnet Libraries’ complaint and his colleague Sheila Bennett, head of libraries strategy and delivery and head of the libraries task force team. “The protest went very well and we hope the new Culture Secretary will accept the children’s invitation to be shown around Barnet libraries. I think it would really help him to understand what it’s like when pin codes replace staff and children and many other vulnerable users have very little access to the library. We need the staff back”. “My grandson was a regular user of our local library on Golders Green Road, before we were locked out. We were very happy to be part of the noise making on this protest. We hope the powers that be will take notice”. 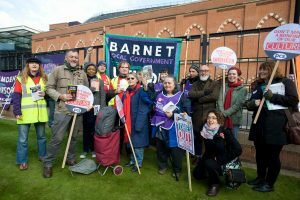 “Before the demonstration all the children signed an invitation to ministers, inviting them to take a tour of Barnet libraries. 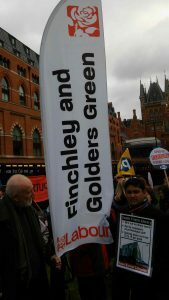 We took it to the demonstration and gave it to the minister’s office.” Alma Marshall Strang age 11 from East Finchley. “Are we going to come and shout at the government every year? It’s not fair to be locked out of the library just because my mum forgot her card. My friend has a library card but his mum doesn’t go because she works so they can’t go into the library” Gabriel Rodis, age 6 pupil at Martin Primary School. “I can walk home alone from school but I’m not allowed into the library on my own? Really? That’s so stupid!” Tommy Gubbins age 9 pupil at Martin Primary School. 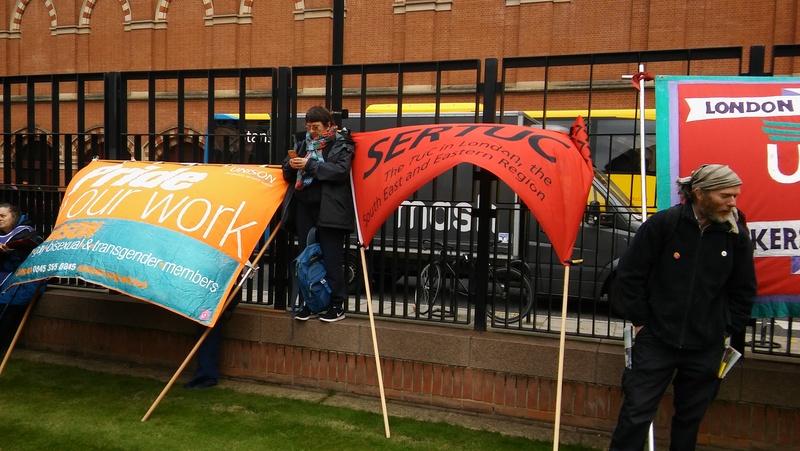 “I’ve recently got back my GCSE options – now I need to put in hard work. I was hoping I could do it at the library but I’m under age and I can’t get in most of the time. And they’ve got rid of the study space too.” Sahr Kamanda age 14 pupil at The Compton School. “My brothers and I used to do Kumon at the library every week and take out books too. Now Kumon doesn’t happen there anymore and I go to the library a lot less. It just isn’t the same as it was before. My mum ends up buying me more books but I can’t try them out first like I used to.” Siah Kamanda age 8 pupil at Martin Primary School. “Libraries help kids to learn about the world and their imagination” Isaiah Akuffo, age 8, pupil at Wessex Gardens Primary School. “Why is the library always closed? 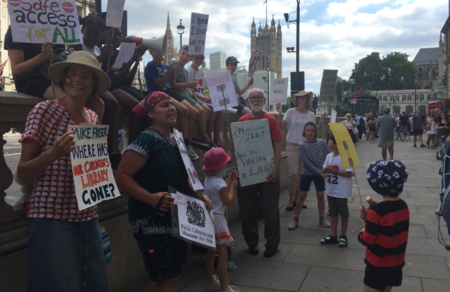 I hope they listen to us” Lottie Pearson age 7 Martin Primary School. 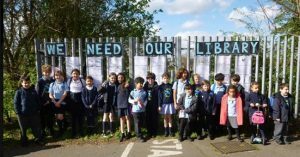 Over 30,000 children in Barnet can no longer use their library service due to cuts and obstacles prohibiting reasonable access. 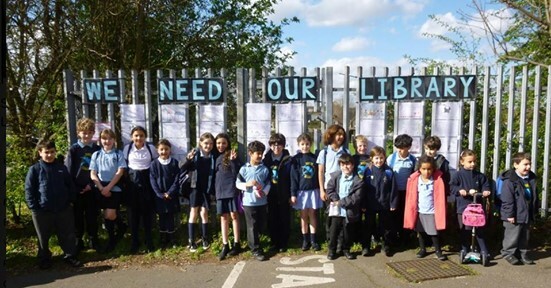 They want to participate in the Summer Reading Challenge but Barnet’s cuts make it nearly impossible and last year Barnet’s participation dropped 63% because kids can’t get into libraries. 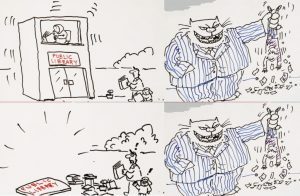 The new Secretary of State, Jeremy Wright QC has the power to change this. Barnet’s children and supporters are gathering to ask he read the Libraries & Museums Act (1964) and use his powers to enforce their rights. The children warmly invite him to come to Barnet and see the impact library exclusion is having on them. 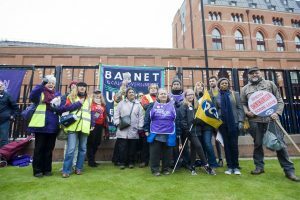 Barnet UNISON Library workers 46% of whom are facing the sack are quite rightly outraged by the latest financial information on Council spend which was published last week. Barnet Council Policy & Resources Committee meets at Hendon Town Hall at 7 pm on Thursday 2 December 2016. It is Agenda Item 10 – Annual Procurement Forward Plan which has caused anger and dismay and disbelief. Making a total of £14.125 million. 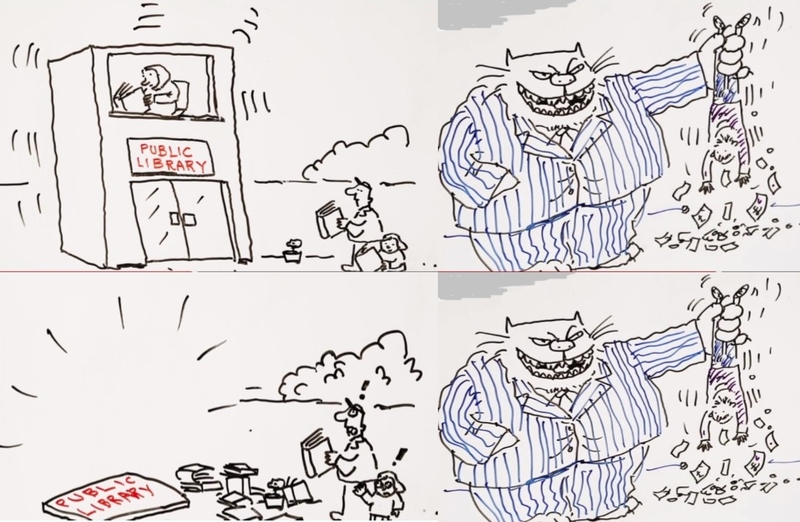 A quick recap on other Barnet Council spend. Below are the Agency/Consultancy figures for the last four years. In the first two quarters of this financial year Barnet Council has spent £9.3 million which, if it continues at this rate, will bring the total spend for this year to over £20 million on Consultants/Agency. 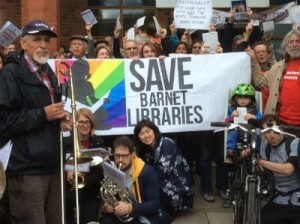 Barnet Council claims it is being forced into the Library changes by a need to cut £2,162 million from the Library Service budget by 2019/20. 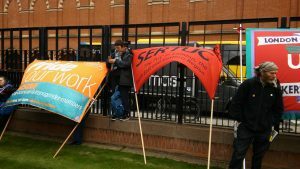 This latest revelation seriously calls into question as to why staff are being made redundant and why a service with a 97% Customer satisfaction is being brutally dismantled. 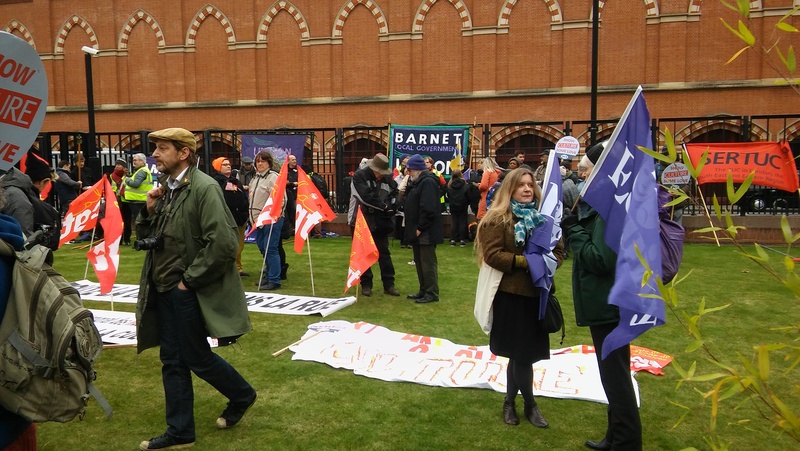 As far as Barnet UNISON is aware the £14.125 million construction and additional costs have never been disclosed in any of the reports going to previous Children’s Education, Libraries and Safeguarding Committees. 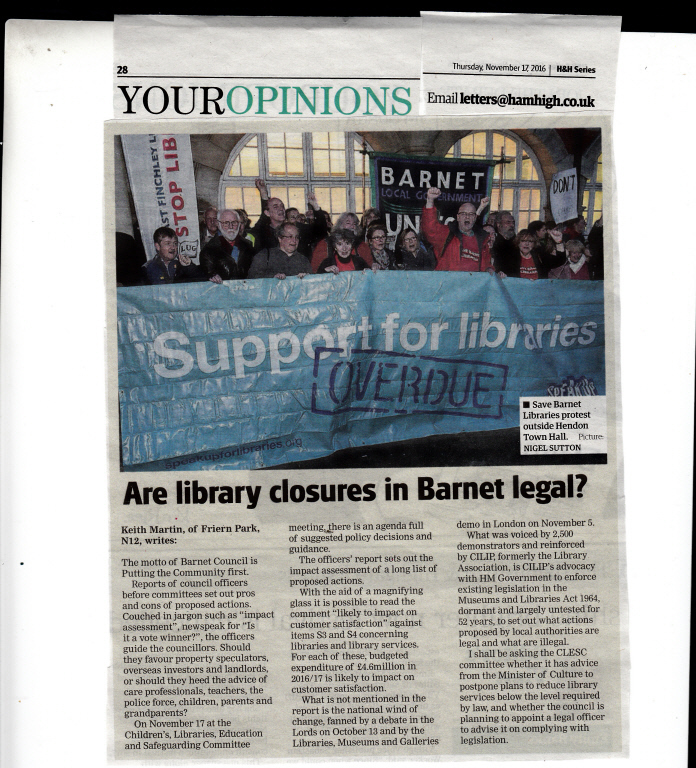 There is still time to stop the destruction of the Barnet Libraries Service. 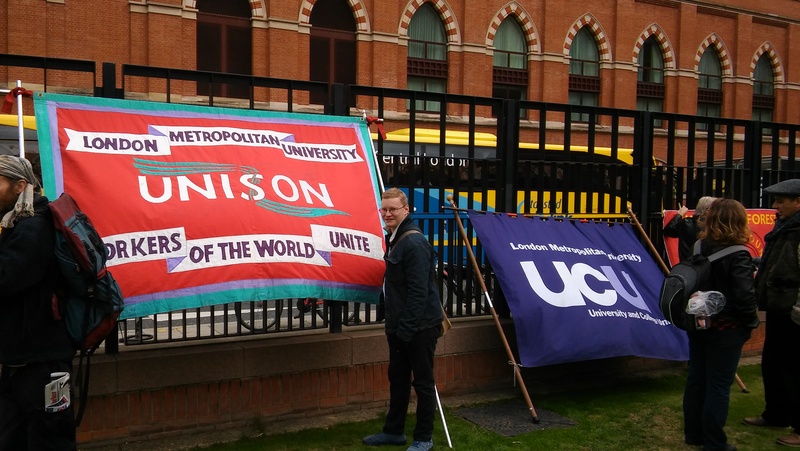 Barnet UNISON will be speaking at General Functions Committee on Tuesday 6 December at 7 pm at Hendon Town Hall. The Leader of Barnet Council Richard Cornelius is on this committee. The committee could refuse to implement the redundancies which would save the Library Service. 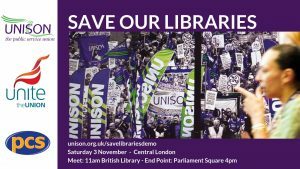 Support your Library Workers this Saturday! 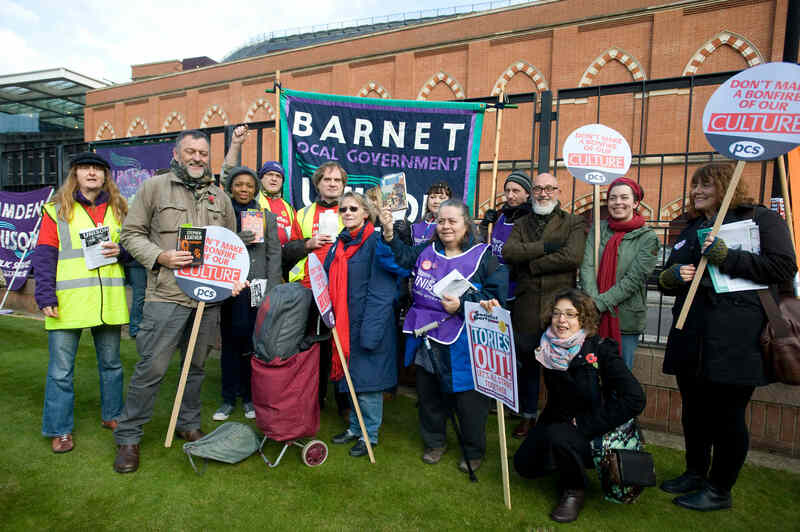 The next picket line by Barnet Library workers will be on Saturday 12th of November, 9am until Midday, at Hendon Library. 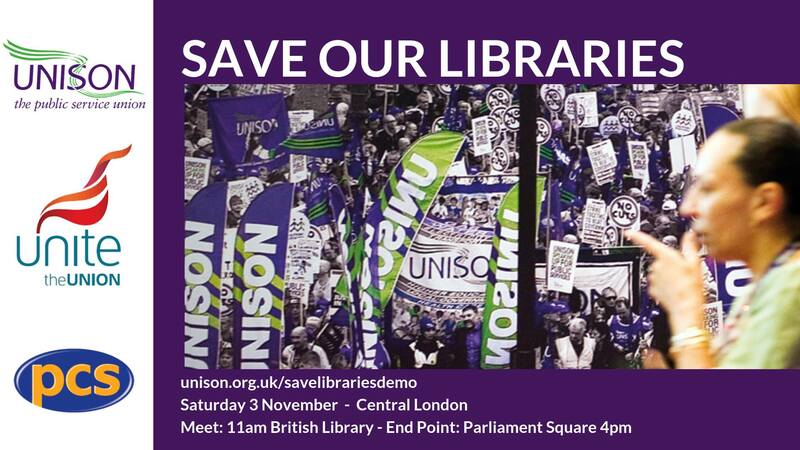 All friends and supporters of properly trained library staff for proper libraries should head along whenever you can on Saturday morning and show your support!